March 19th, 2019 at 6pm: FREE PRUNING WORKSHOP at the orchard sponsored by Eaton County Conservation District from 6-8 pm. This complimentary, hands-on workshop offers the home gardeners the opportunity to learn or freshen up their fruit tree pruning skills. You will need to call (517) 543-1512 x 5 to reserve your spot. We will have an indoor presentation followed by a walk and demonstration in the apple and peach trees here at the Country Mill. We will also discuss pruning of bushes like blueberries. Dress for the weather. Wear boots. July 23rd, 2019 PICK YOUR OWN BLUEBERRIES at our NEW PATCH on OTTO ROAD until mid-August. PICK YOUR OWN APPLES as well starting approximately August 5th. We are also offering pre picked blueberries, peaches, sweetcorn and apples. ​ Call or check Facebook for exact varieties and dates. BLUEBERRY DONUTS are made fresh daily. Frozen cider is available in late July with fresh pressed cider starting by mid-August. Tuesday- Saturday 9 am - 6 pm and Sunday 11am-6pm. August: Come inside our air conditioned farm market to enjoy special blueberry donuts, cider slushes, blueberry jam and more. Early apple picking along with the farm market are open from 9 am - 6 pm. Check Facebook or call for specifics on the blueberry and apple picking schedule. Open Tuesday- Saturday 9 am - 6 pm and Sunday 11am-6pm. September Weekdays & Weekends, Wine Tasting is noon-5pm daily. Llama & alpaca, Apple and Pumpkin picking available while open. Saturday, August 31st: Try out our new APPLE CANON! Shoot 5 apples for only $3 and run through the corn maze for $3 per person. Celebrate Labor Day weekend with peaches. Don't miss out on your last taste of summer. 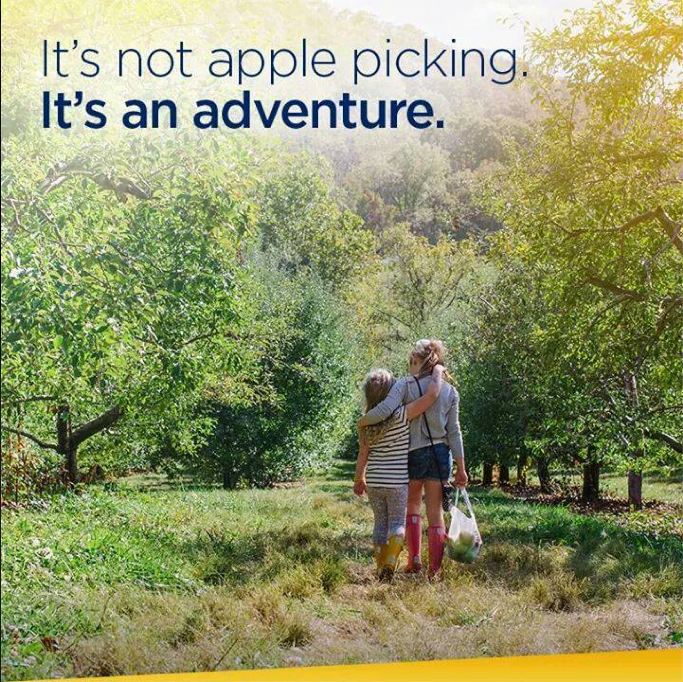 You can also pick your own apples off the tree. Fresh cider, donuts, peaches, apples and baked goods are all available inside the farm market. 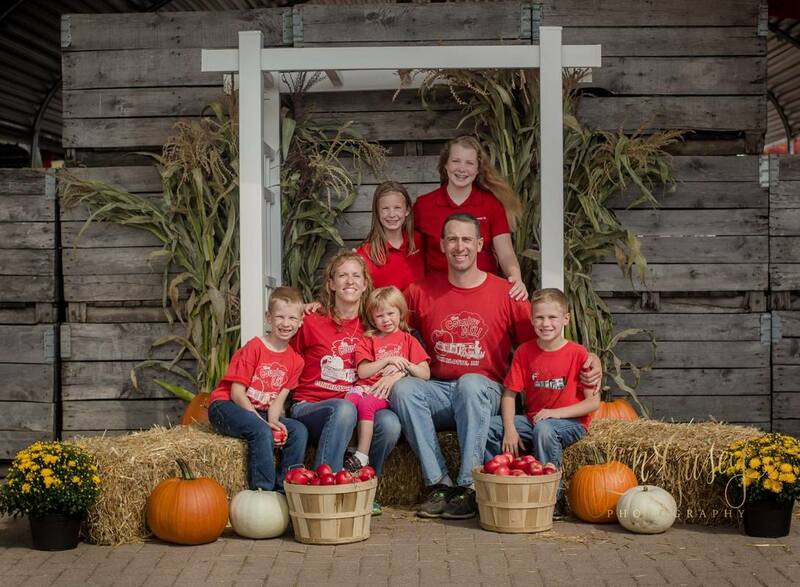 Sunday, September 1st: FREE FAMILY PHOTO SHOOT at the orchard from 2-4 pm. Show up with the people you love to create a fantastic fall memory. Professional photographer Jennifer Gusey will take your photos and then post the digital photo on Facebook by September 13th. You can then download it to use. Shoot 5 apples for only $3, run through the corn maze for $3 per person. Saturday, September 7th: Train Rides to the Orchard 1-5 pm. Llama & alpaca, Apple picking, & Pumpkin picking from 9 am - 6 pm. Enjoy a FREE tractor wagon ride around the farm this Saturday and Sunday only from 1-5pm. Shoot 5 apples for only $3 and run through the corn maze for $3 per person. Sunday, September 8th: Train Rides to the Orchard 1-5 pm. Llama & alpaca, Corn Maze, Apple Picking & Pumpkin picking from 11 am - 6 pm. Enjoy a FREE tractor wagon ride around the farm this Saturday and Sunday only from 1-5pm. Shoot 5 apples for only $3 and run through the corn maze for $3 per person. Saturday, September 14th: $10 Wrist band for all activities OR $3 each for Train Wagon Ride, Apple Cannon (5 shots), Pumpkin Pitch (3 shots), and Corn Maze (30-60 minutes) all from 1-5 pm. Llama & alpaca, Apple picking, & Pumpkin picking from 9 am - 6 pm. Sunday, September 15th: $10 Wrist band for all activities OR $3 each for Train Wagon Ride, Apple Cannon (5 shots), Pumpkin Pitch (3 shots), and Corn Maze (30-60 minutes) all from 1-5 pm. Llama & alpaca, Corn Maze, Apple Picking & Pumpkin picking from 11 am - 6 pm. Saturday, September 21st: The Michigan Apple Festival is at The Country Mill where you can enjoy everything about apples and more. Apple wine tasting is noon-5pm. Apple Picking, llama, alpaca, & Pumpkin picking from 9 am- 6 pm. Bring the family for a $5 horse drawn wagon ride from 1-5pm. Activities are a $10 Wristband for the following activities OR $3 each for Train Wagon Ride, Apple Cannon (5 shots), Pumpkin Pitch (3 shots), and Corn Maze (30-60 minutes) all from 1-5 pm. Free Blacksmith Demonstrations from noon-4pm by Al Vasaris from Log House Forge (www.loghouseforge.com). Sunday, September 22nd: The Michigan Apple Festival continues with the sights, smells, and flavors of everything apples. Enjoy performances by the Dance Studio from 2-3pm. Free Blacksmith Demonstrations from noon-4pm by Al Vasaris from Log House Forge (www.loghouseforge.com). Apple wine tasting is noon-5pm. Activities are a $10 Wristband for the following activities OR $3 each for Train Wagon Ride, Apple Cannon (5 shots), Pumpkin Pitch (3 shots), and Corn Maze (30-60 minutes) all from 1-5 pm. Bring the family for a $5 horse drawn wagon ride from 1-5pm. 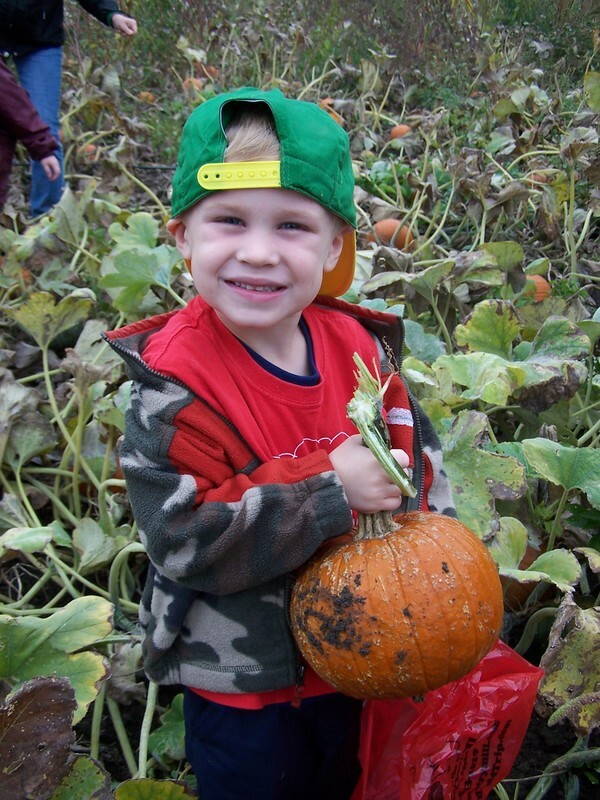 Apple Picking, visit the Llama & alpaca, at the Petting Zoo & Pumpkin picking from 11 am -6 pm. 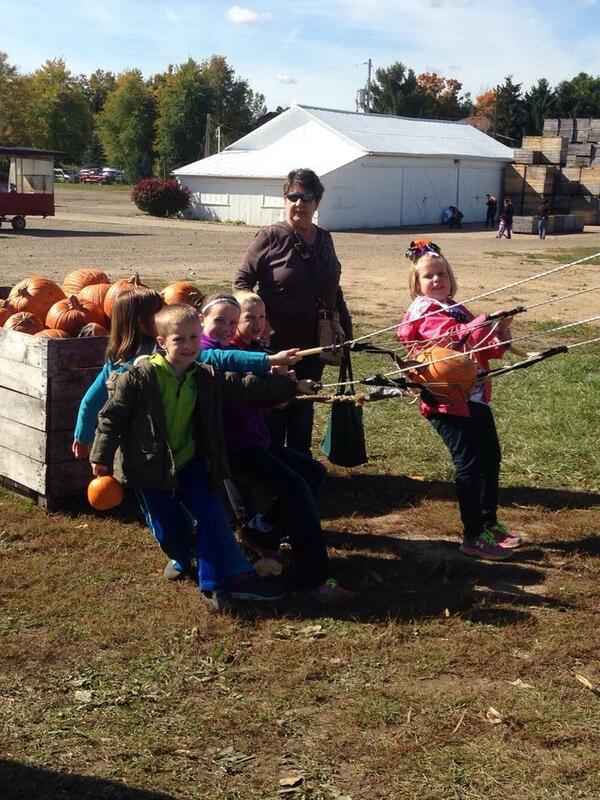 ​Saturday, September 28th: Saturday is the first day for Michigan’s 32nd annual Pumpkin Carrying Contest from 2 to 4 pm, come and see how many pumpkins your friends can load into your arms. A complimentary gift certificate to Davis Chiropractic Center in Charlotte is give to the person to carry the most pumpkins on Sunday only. Apple wine tasting is noon-5pm. Apple Picking, llama, alpaca, & Pumpkin picking from 9 am- 6 pm. Bring the family for a $5 horse drawn wagon ride from 1-5pm. Activities are a $10 Wristband for the following activities OR $3 each for Train Wagon Ride, Apple Cannon (5 shots), Pumpkin Pitch (3 shots), and Corn Maze (30-60 minutes) and Storybook Hayride. Storybook Hayride is a great family event where you will be entertained by characters like the Big Bad Wolf, Little Red Riding Hood, and Three Little Pigs while enjoying a wagon through the orchard. 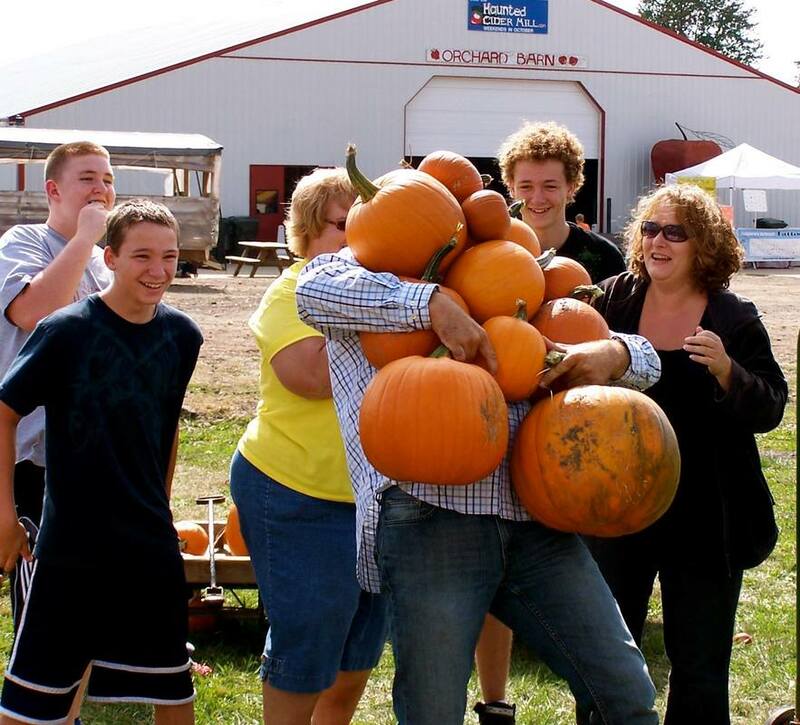 Sunday, September 29th: Michigan's 32nd annual Pumpkin Carrying Contest from 2 to 4 pm, come and see how many pumpkins your friends can load into your arms. The top man or woman to carry the most pumpkins on Sunday will receive a complimentary gift certificate to Davis Chiropractic Center in Charlotte. Apple wine tasting is noon-5pm. Apple Picking, llama, alpaca, & Pumpkin picking from 9 am- 6 pm. Activities are a $10 Wristband for the following activities OR $3 each for Train Wagon Ride, Apple Cannon (5 shots), Pumpkin Pitch (3 shots), and Corn Maze (30-60 minutes) and Storybook Hayride. Storybook Hayride is a great family event where you will be entertained by characters like the Big Bad Wolf, Little Red Riding Hood, and Three Little Pigs while enjoying a wagon through the orchard. There will be NO horse wagon rides on Sept 30. 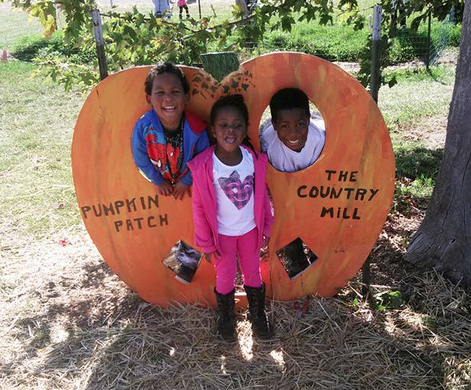 October Weekdays : Apple Picking, Visit Alpacas, Ducks & Turkeys at the Petting Zoo, & Pumpkin picking from 9 am- 6 pm. Saturday, October 5th: Apple wine tasting is noon-5pm. Visit and feed the llama and alpaca or go apple picking & pumpkin picking from 9 am- 6 pm. 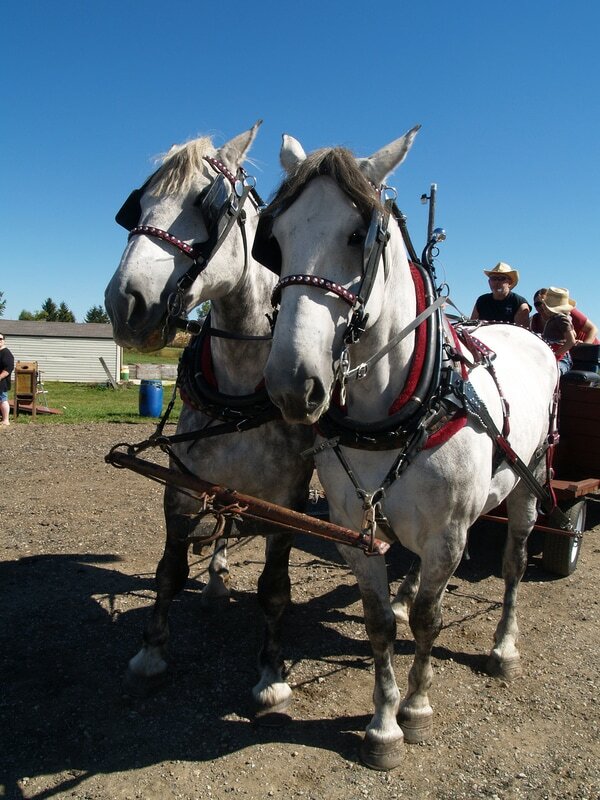 Bring the family for a $5 horse drawn wagon ride from 1-5pm. Activities are a $10 Wristband for the following activities OR $3 each for Train Wagon Ride, Apple Cannon (5 shots), Pumpkin Pitch (3 shots), and Corn Maze (30-60 minutes) and Storybook Hayride. Storybook Hayride is a great family event where you will be entertained by characters like the Big Bad Wolf, Little Red Riding Hood, and Three Little Pigs while enjoying a wagon through the orchard. Sunday, October 6th: Apple wine tasting is noon-5pm. Visit and feed the llama and alpaca or go apple picking & pumpkin picking from 11 am- 6 pm. Bring the family for a $5 horse drawn wagon ride from 1-5pm. Activities are a $10 Wristband for the following activities OR $3 each for Train Wagon Ride, Apple Cannon (5 shots), Pumpkin Pitch (3 shots), and Corn Maze (30-60 minutes) and Storybook Hayride. Storybook Hayride is a great family event where you will be entertained by characters like the Big Bad Wolf, Little Red Riding Hood, and Three Little Pigs while enjoying a wagon through the orchard. Saturday, October 12th: Apple wine tasting is noon-5pm. Visit and feed the llama and alpaca or go apple picking & pumpkin picking from 9 am- 6 pm. Activities are a $10 Wristband for the following activities OR $3 each for Indoor Inflatable Play Area, Train Wagon Ride, Apple Cannon (5 shots), Pumpkin Pitch (3 shots), Corn Maze (30-60 minutes) and Storybook Hayride. Storybook Hayride is a great family event where you will be entertained by characters like the Big Bad Wolf, Little Red Riding Hood, and Three Little Pigs while enjoying a wagon through the orchard. Outdoor events are subject to the weather. Sunday, October 13th: Apple wine tasting is noon-5pm. Visit and feed the llama and alpaca or go apple picking & pumpkin picking from 11 am- 6 pm. Activities are a $10 Wristband for the following activities OR $3 each for Train Wagon Ride, Apple Cannon (5 shots), Pumpkin Pitch (3 shots), and Corn Maze (30-60 minutes) and Storybook Hayride. Storybook Hayride is a great family event where you will be entertained by characters like the Big Bad Wolf, Little Red Riding Hood, and Three Little Pigs while enjoying a wagon through the orchard. Saturday, October 19th: Apple wine tasting is noon-5pm. Visit and feed the llama and alpaca or go apple picking & pumpkin picking from 9 am- 6 pm. Activities are a $10 Wristband for the following activities OR $3 each for Train Wagon Ride, Apple Cannon (5 shots), Pumpkin Pitch (3 shots), and Corn Maze (30-60 minutes) and Storybook Hayride. Storybook Hayride is a great family event where you will be entertained by characters like the Big Bad Wolf, Little Red Riding Hood, and Three Little Pigs while enjoying a wagon through the orchard. Sunday, October 20th: Apple wine tasting is noon-5pm. Visit and feed the llama and alpaca or go apple picking & pumpkin picking from 11 am- 6 pm. Bring the family for a $5 horse drawn wagon ride from 1-5pm. Activities are a $10 Wristband for the following activities OR $3 each for Train Wagon Ride, Apple Cannon (5 shots), Pumpkin Pitch (3 shots), and Corn Maze (30-60 minutes) and Storybook Hayride. Storybook Hayride is a great family event where you will be entertained by characters like the Big Bad Wolf, Little Red Riding Hood, and Three Little Pigs while enjoying a wagon through the orchard. 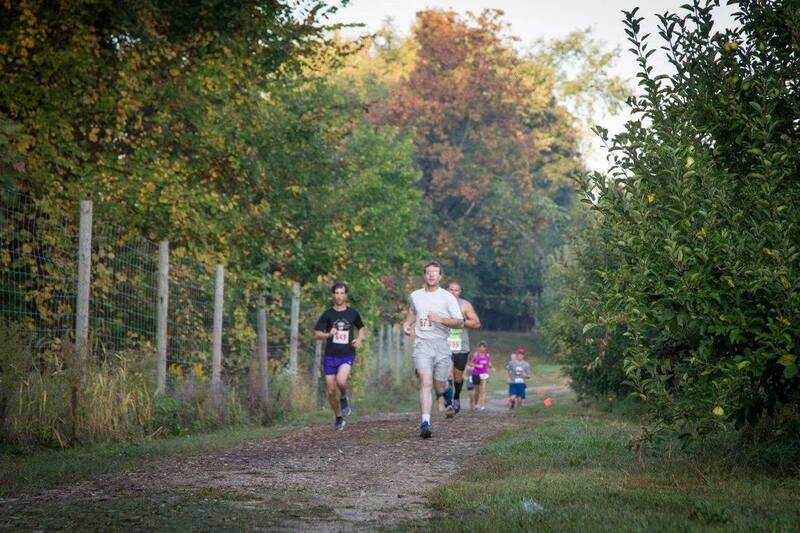 Saturday, October 26th: 5K and 1 miler at 9am. 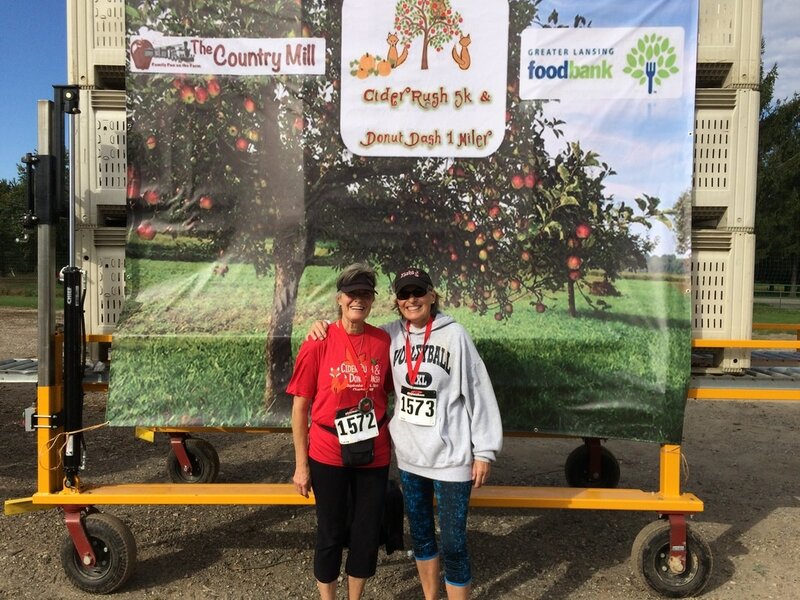 Entrants receive a shirt, donut, cider, and the scenic, chip-timed trail route of apple trees and pumpkin patches! All ages welcome for either event and we are family friendly! 5k awards! Afterwards feel free enjoy more autumn fun! Registration to open soon. ​Apple wine tasting is noon-5pm. Visit and feed the llama and alpaca or go apple picking & pumpkin picking from 9 am- 6 pm. Bring the family for a $5 horse drawn wagon ride from 1-5pm. Activities are a $10 Wristband for the following activities OR $3 each for Train Wagon Ride, Apple Cannon (5 shots), Pumpkin Pitch (3 shots), and Corn Maze (30 minutes). Sunday, October 27th: 12th Annual PICK A PECK FOR PEOPLE. God has blessed us with apples to harvest. 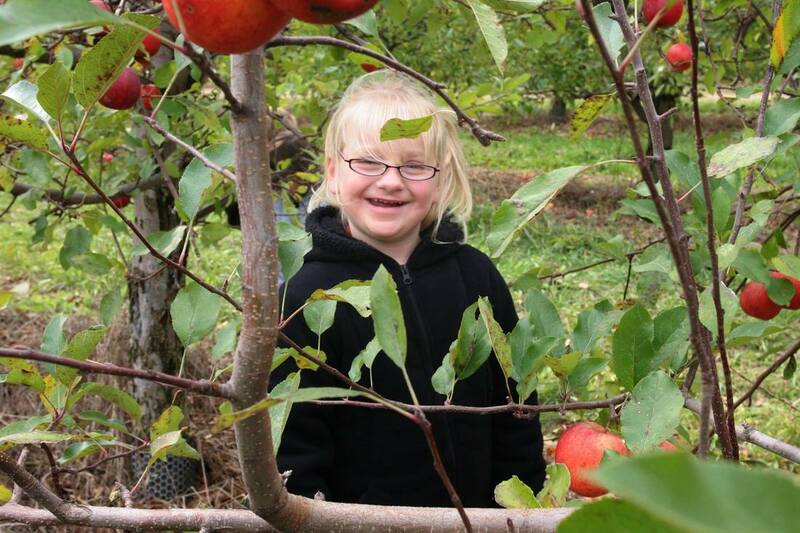 From 1-5 pm come pick a bag of apples for those in need and receive a complimentary hayride or corn maze ticket. This event is free of charge. 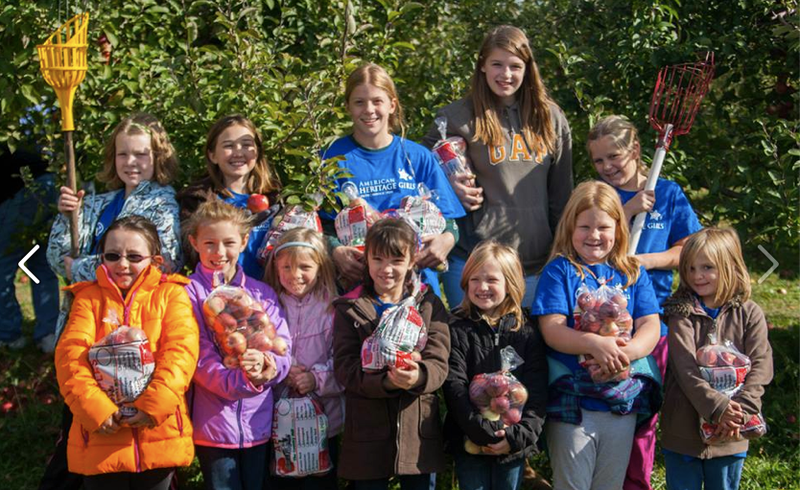 All apples picked are donated to the Greater Lansing Food Bank and the St. Vincent DePaul Food Bank who will have a truck on hand to haul away all the apples that you pick. This is a great family or group event. We are honored to have Family Life Radio as a media sponsor. Stop by the Family Life Radio table to turn in your full bags of apples and receive complimentary corn maze and wagon ride tickets. Click here: pick_a_peck_for_people_article.pdf to find out how this event impacts our communities' local food banks. ​ Apple wine tasting is noon-5pm. Visit and feed the llama and alpaca or go apple picking & pumpkin picking from 11 am- 6 pm. Bring the family for a $5 horse drawn wagon ride from 1-5pm. Activities are a $10 Wristband for the following activities OR $3 each for Train Wagon Ride, Apple Cannon (5 shots), Pumpkin Pitch (3 shots), and Corn Maze (30 minutes). Tuesday, Wednesday, Thursday October 29th, 30th & 31st: Fresh Donuts, Apple Picking, visit llama & alpaca at the Petting Zoo, & Pumpkin picking from 9 am- 6 pm. Friday, November 1st: Bakery and Farm Market reopen on Friday, Saturday & Sundays until Thanksgiving. Saturday & Sunday November 2nd & 3rd: TRAIN LAYOUT open for free. In appreciation of your business, we invite you to come and visit our Lionel Train Layout from 12- 4 pm for free. It runs at the top of the hour. Saturday & Sunday November 9th & 10th:TRAIN LAYOUT open for free. ​Saturday & Sunday November 16th & 17th: TRAIN LAYOUT open for free. ​Saturday & Sunday November 23rd & 24th: THANKSGIVING PIE EARLY BIRD ORDERS DUE by Sunday at 5pm. Pre-pay for your holiday pies and receive 10% off. In appreciation of your business, we invite you to come and visit our Lionel Train Layout from 12- 4 pm for free. It runs at the top of the hour. This is the last weekend for fresh cider and donuts. ENJOY! Wednesday, November 27th, THANKSGIVING PIE PICKUP, 9 am- 6 pm. Pick up your holiday pies. Final day for fresh donuts, pies, apples & cider. Thanksgiving - July 22nd: Weddings, Receptions and Special Events! The Farm Market is closed during this time, but Apple Wine, Hard Cider, frozen sweet cider, DocCherry, and other market items are available by appointment please call or email if you would like something. Thank you.